This is a sponsored post for Smokin’ O’s I was provided product but the thoughts and all opinions are all mine. Here’s a new tasty grilling idea for you, Smoke House Almonds on the Grill. Yes, it’s definitely outside the norm, but a welcome addition to any grilling rotation nonetheless. I’m always looking for something new to do on the grill aren’t you? 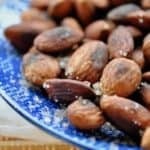 These Smoked Almonds cook in under 10 minutes and because you use a Smokin O’s you’ll get a smokey flavorful almond with just a touch of salt. Smoke flavor without the smoker! Smokin’ O’s are these cool little wood doughnut things that you simply pop on the grill as it’s warming up. They begin to smoke after 10 minutes or so and give whatever you’ve got going on in the grill a perfect smoke flavor. I’ve used them on a Rotisserie Rib Roast, in that case 3 over the course of the cooking period and I’ve done simple grilled chicken as well, and each time the smoke flavor is definitely there but NOT overwhelming. 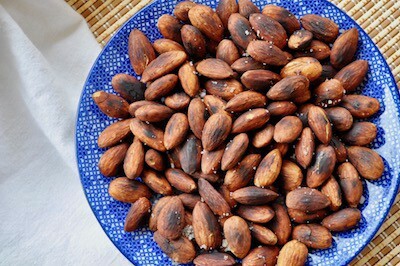 You can enjoy Smoked Almonds in salads, in lunches or just straight up snacking at home. I love to keep these on hand for those moments when I NEED FOOD. Does that happen to anyone else? Suddenly your blood sugar drops and and life as you know it is OVER. That’s the time I reach for something like almonds because they give me a boost to get through until meal time. Or sometime they just become a mini meal. 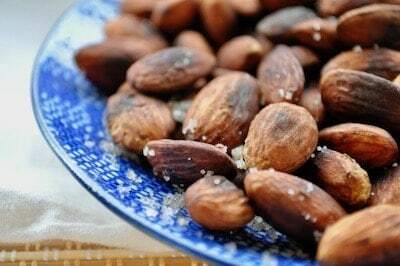 Here's a new tasty grilling idea for you, Smoke House Almonds on the Grill. It's definitely outside the norm, but a welcome addition to any grilling rotation. I LOVE anything smoked. So, these smoked almonds are on my “must try” list. Yeah Yeah YEAH!! I love them too but they are SO salty and full of junk ingredients! I love that you smoked your own almonds. I’m going to try this. Ha! Not TOO smart I still eat them when they’re way toooooooo hot! Oh, do these every sound wonderful…all that smoky, nutty, yummy goodness! Great #RecipeMakeover! Yayyy for almonds! :D!!! This sounds amazing!